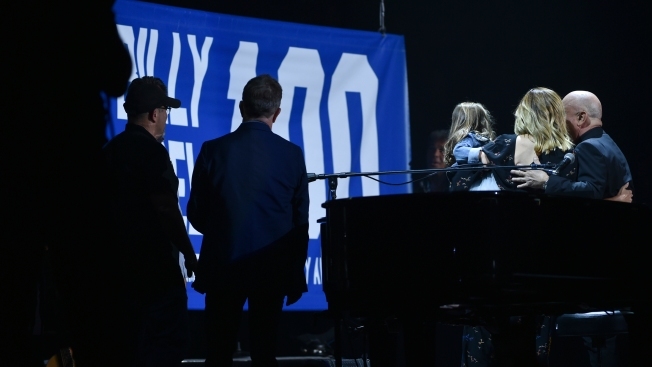 Billy Joel, right, watches the 100th show banner being raised with his wife Alexis Roderick and daughter Della Rose Joel during his 100th lifetime performance at Madison Square Garden. Bruce Springsteen propped himself on top of Billy Joel's piano to sing a duet with the Piano Man, who was celebrating his 100th concert at Madison Square Garden on Wednesday night. Joel told the energetic crowd he had a guest coming onstage who has won a Grammy, Oscar and Tony. Springsteen emerged, surprising the feverish and fanatic audience, who loudly cheered "BRUCE." "Congratulations Billy on your 100th show," Springsteen yelled. "Ready, Billy?" he asked, as Joel began to play while sitting at the piano. Springsteen encouraged the crowd to cheer louder and then sang "Tenth Avenue Freeze-Out." He jumped onto Joel's piano - making it on his second try - and sat on it while Joel played and the piano slowly spun. Springsteen then rocked his guitar for "Born to Run." A banner celebrating Joel's 100th performance at MSG rose to the ceiling near the top of the two-hour-plus concert. Joel started performing a monthly residency at the arena in 2014. No artist has performed at the famed venue more than Joel. "Good evening to you New York City," said Joel, whose two-year-old daughter, Della Rose Joel, sat on his lap. "I want to thank you all for coming to our show." Joel was excited throughout his set, going from piano to harmonica to guitar. He put on his sunglasses while he passionately sang "New York State of Mind" and twirled his microphone stand in the air and danced happily after singing "Uptown Girl." He said he had to think of a special song to sing to celebrate his new milestone, and then performed "This Is the Time." "Maybe it'll hit me later," he said of his new feat. Earlier on Wednesday Governor Andrew Cuomo proclaimed July 18, 2018 as "Billy Joel Day." Joel, who was born in the Bronx, first performed at MSG on December 14, 1978. His piano is on display in front of the venue.